Frequent instances of intervention in current world affairs have threatened the status of nonintervention as a rule of international relations. 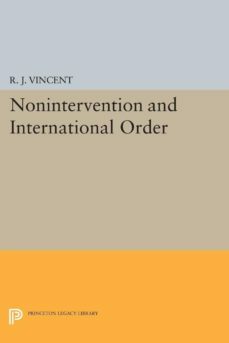 Gathering evidence from history, law, sociology, and political science, R. J. Vincent concludes that the principle of nonintervention can and must remain viable.The author approaches the question from several angles, seeking to discover why the principle of nonintervention has been asserted as part of the law of nations; whether states in the past and present have conducted their foreign relations according to the principle of nonintervention; and what function the principle performs in the society formed between states.The author examines the principle of nonintervention through examples taken from contemporary world politics, focusing on its role in the doctrine and practice of the Soviet Union, the United States, and the United Nations. He argues that, despite the erosion of the order of sovereign states, the arrival of nuclear response weapons, all-enveloping ideological conflict, and transnational relationships that diminish the significance of state frontiers, the principle of nonintervention continues to contribute to the international order.Originally published in 1974.The Princeton Legacy Library uses the latest print-on-demand technology to again make available previously out-of-print books from the distinguished backlist of Princeton University Press. These paperback editions preserve the original texts of these important books while presenting them in durable paperback editions. The goal of the Princeton Legacy Library is to vastly increase access to the rich scholarly heritage found in the thousands of books published by Princeton University Press since its founding in 1905.